I spent last Friday afternoon wandering the streets of downtown alone while I waited to meet with a friend. The skies were sunny, but a balmy breeze made it not unbearably hot. My goal was to do some people-watching and then take a selfie with this statue of Mark Twain that sat on a bench in the park. It was crowded when I got there. Tons of people were already walking around the park. Worst news was, the place next to Mark Twain was already occupied by a hipster type fellow. And he was already people-watching with Mr. Twain. They were watching a couple take some sickeningly lovey-dovey selfies nearby. The man didn’t seem like he was about to go anytime soon, so there ended my plans. And there, the loneliness crept up on me again. I walked on, feeling rather lost. Lost in a way I hadn’t felt in awhile. Nearby the park, a street fair was in progress. Loud music blasted in the background, wafts of barbecue mixed with scented candles sold by one of the vendors floated into my nose. Children munched on kettle corn and played in a humongous, bouncy funhouse. Teenagers laughed with their friends as they decided on their Friday night plans. And I felt…impatient. Prone to looking at the time on my phone to see if it was 7 yet, the time when my friend would come, and I would no longer have to suffer feeling alone. At that moment, she called. For a moment, hope flickered. Maybe she was here. Maybe she was early. But nope, unfortunately, she was stuck in traffic and would be 25 minutes late. I wandered aimlessly again in the sea of strangers all too occupied with their busy lives. And I no longer cared to people-watch. Because now my mind was centered around me. Feeling sorry for me. Thoughts all occupied by the discontent brewing in my heart. One thought led to another. And here is the inner dialogue that took place. Angry me: Why can’t your life be different? Why can’t you take risks? Reflective me: That’s the two word excuse you always make to bow out of a new opportunity or experience. It comes right before “No.” No, not today, maybe later. That’s what you always say. Sarcastic me: Yup, so you’ll always stay right on the couch where it’s safe and no one can threaten your life or your heart. What a great life you’ll be living. Exasperated me: Just what are you afraid of? Scared me: I’m afraid of taking risks with my dreams, in love, in life. I’m afraid of what people will say. The criticisms, scathing remarks that put me down and crush my soul. I’m afraid of what one guy can do. The power he may have to crush my heart in the palm of his hand, to freeze my soul with his coldness. I’m afraid of what I might not be able to do. The failed attempts and bitter struggles that will knock me off my feet time and time again until I no longer know who I am. Reflective me: Who are you? Do your hopes and dreams define you then? If your hopes and dreams become buried in the sand, if all your chances to fall in love only end up unreciprocated, then what? At this point, I came to a toy shop. Since I had time to kill, I decided why the heck not? So I went in. And the first thing my eyes connected with was her. 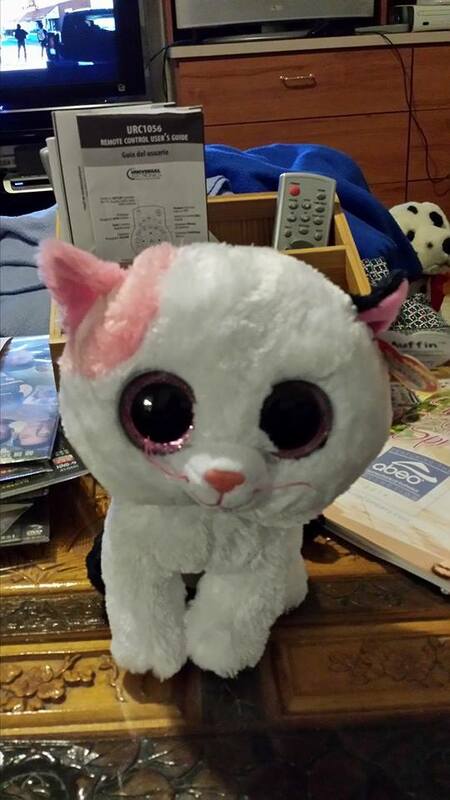 A stuffed animal—a white kitten with humongous eyes that reminded me of my cat. And she was looking at me. Her name was Muffin. And it was like God was speaking to me. Not only was He giving her to me to be my companion that day, not only was He encouraging me to be more positive, He was also slightly chiding me. Reminding me of everything I had already. Why was I complaining again? Why was I discontent, when He had already given me so much? So back to my earlier question: if all my hopes and dreams become buried in the sand, then what? Then I’m still me. I’m still the daughter of the King. I’m still loved by God. And He will provide. But I still have to try to take action. I can’t just stay on the couch and expect something to happen. I have to take risks, and I have to say “yes” more often (but be wise when I do). And if nothing happens even after the risks are taken, so be it. I may be heartbroken, but that won’t last forever. Because in the end, my identity is not in how successful I may be or if I ever start a family of my own. My identity is in Christ and in Christ alone.